Traveling Postcard US-2722710 to Czech Republic shows a baby golden snub-nosed monkey (金丝猴), perching in a highland forest at elevations between 1,500 and 3,400 meters above sea level in Sichuan, China. 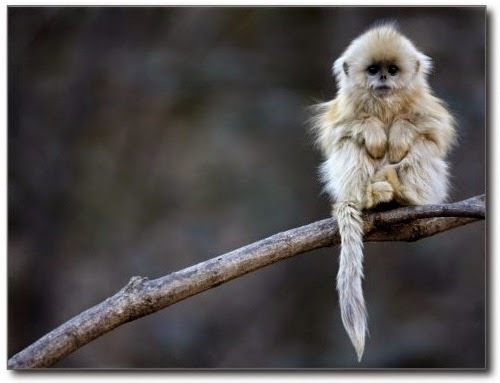 According to Wikipedia, the golden snub-nosed monkey (Rhinopithecus roxellana) is an Old World monkey, endemic to a small area in temperate, mountainous forests of central and Southwest China. The golden snub-nosed monkey is endangered due to habitat loss. It is also the most treasured national animal in China next to Panda. The postcard was purchased from the National Geographic store at Zazzle. Copyright by Cyril Ruoso/Minden Pictures.